No Smilin'Flap-Jacks in April !! We'll be at Sun-N-Fun. The breakfast is held at Building 10. 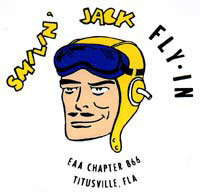 A Brief History of Smilin' Jack and EAA Chapter 866 . . .
Larry Gilbert writes a little flying story about once a month. Fly in, drive in, or walk in. 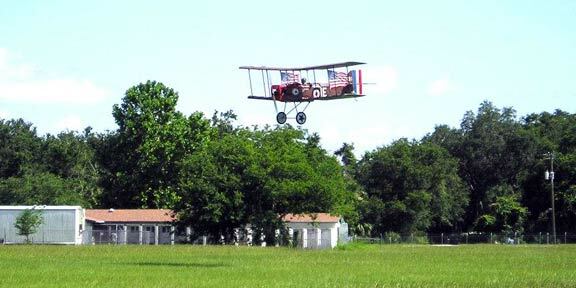 See experimental, homebuilt, classic, and antique aircraft. There will be good food, vendors and lots to see. For the first time in several years, we had to hold a make-up day for our annual Young Eagles event. Our regular October Young Eagles event had a great turn-out, but the winds were a little breezy that morning, and we flew less than half of the Young Eagles candidates that registered before we had to call a stop. A number of the young folks had waited patiently for more than 2 hours to get a chance to go for an airplane ride. Eddie did his best to entertain them with aviation stories and educate them about what makes an airplane fly and what it takes to become a pilot. Eventually, due to the deteriorating weather conditions, we had to send many of them home without a ride. As chapter President, I was committed to having the chapter offer them another opportunity to take a flight experience with us. Your Chapter Young Eagles Coordinator, Larry Gilbert, really stepped up and did a first class job to make that happen!! A make-up date was quickly organized, and the deferred Young Eagles and their parents were notified about the opportunity to try to fly again in mid-November. Many of them returned, and we had a few more planes and pilots this time around. The weather was perfect and we flew 29 more Young Eagles! 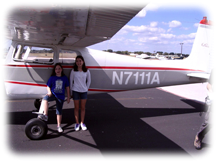 This is a great program for getting young people exposed to aviation and maybe even light the spark that sends them forward into an aviation career someday. 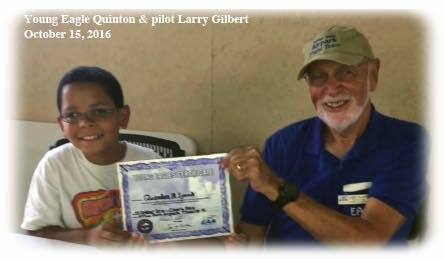 A Huge Thanks goes out to Larry, to all the volunteer pilots, and to all our chapter members for coming out again to help make our second Young Eagle event of 2017 such a big success! NOTE: If those who have already registered all show up we'll have about all we can handle. We had a very impressive turn-out for our annual Young Eagles Rally! It was a Great Day for the youngsters and for our chapter members. You all did a great job getting the word out about the Young Eagle Rally and rounding up candidates to fly. So good of a job in fact, that we were not able to fly all of the eager young flyers before the weather got too uncomfortable for rides. Even with the breezy conditions, our volunteer pilots managed to fly 30 Young Eagles and there were a lot of smiles and excitement to go around. Each of those Young Eagles went home with a Certificate, a Log Book, a Smilin' Jack Chapter patch, and a very special memory! I managed to show a couple of aviation videos in the chapter building using the new Audio Video equipment that Richard engineered. I had hoped that some folks could pass the time watching an EAA video while they waited for their airplane ride, and a few did. A BIG THANK YOU goes out to all the pilots, all the volunteers, and to your Young Eagle Coordinator Larry Gilbert for making this such a successful event again this year! The worst part of the event was having to turn away so many folks who had patiently waited for two or three hours to get a ride. So, we will be holding a "make-up" Y-E rally later this month on Saturday Nov. 18th. We'll make every effort to fly the rest of the young folks who registered with us so that none of them miss the opportunity to go for an airplane ride. We'll talk more about that at the chapter meeting on Wednesday Nov. 1st. Young Eagles......... It Ain't over yet! It seemed like 10/21 would never get here because the Y-E event was on my mind every day for a couple of months. On thurs 10/20 I told Loretta just a couple of more days and this Young Eagle stuff will all be out of our minds for this year anyway. We did a lot of planning and most of it worked out. We had over a period of months, lined up nine pilots and airplanes for the 21st. That was the one thing that we thought we didn't have to worry about. We were concentrating our efforts on getting the candidates more than anything and worried about not having enough to keep the pilots busy. Murphy's law kicked in and at our briefing we discussed the fact that the forecast for Sat at 9:00 am the wind will be 090@14G21 kts. Our wise and responsible pilots had second thoughts about flying someone's child in their airplane in those conditions and opted out. Some of us decided that we would see what developed in the morning. A shortage of airplanes and a surplus of candidates developed! 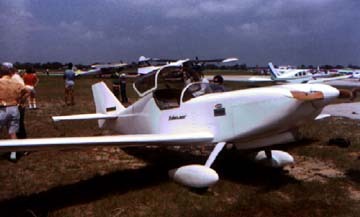 Instead of nine airplanes we had only five airplanes and one of those wouldn't start when it came time to fly so we were left with 3 taildraggers and 1 nose dragger light sport airplane. All of them 2 place airplanes. We started flying and the high winds never materialized so another chapter member brought his 2 place nose dragger out to fly some of the youth. 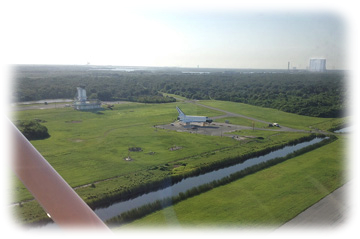 Four of us took advantage of the reduced X wind component (090@9kts) to use rwy 04 with a little more headwind component. The airport groomer, Mickey, made sure that rwys 04/22 were in top notch condition the grass was in good condition and no hay lying on the ground to tangle things up. I for one do appreciate that! With 5 planes we flew 30 Young Eagles and it took from 8:00 am to almost 1:00 pm to do that. So, 72 candidates showed and only 30 flew. A decision was made to re schedule a day for flying those who didn't get to fly. That day is Nov. 18. What went very right was the registration and certificate process that was set up in bldg.. 10. The flow of paperwork went very well with Loretta's set up and with a table full of cookies and rice crispy treats that she made, the kids had a field day with this. Laura Wood did a wonderful job of taking pictures! Les did some ground school and visual video stuff with my laptop in the meeting room Eddie looked like he was doing some ground school too so, there was enough activity at all times to keep the kids busy. Two CAP cadets and their supervisors helped a lot out too. The disappointing part is that not all got to fly. I've been in touch via email with these 42 except for those who gave us an incorrect address (3 or 5) and gotten response from several. Most of these have been positive although a couple can't make it. It amazes me that the word got out to some so far away from Titusville. I did a ride with one from Orange City, at least one was from St. Cloud and a couple of were from Deland! Bill Heffron contacted Tville High School and at least 6 from the aviation program there showed up. Herman got a few as a result of his and Becky's efforts and other than the good Facebook response we got and the banner on our building got us a few. Loretta and I made physical sales calls to several local churches. I know you all made a good effort to recruit these Young Eagle candidates too. Good job! We have 8 planes and pilots who say they'll fly and one who said he'd help if needed on the 18th. If the wx cooperates and everyone is well, it should be a beautiful thing. Hopefully our ground crew will return in force. I will be in touch with you all via email for the Nov. 18 event. I have the insurance coverage in place too. The Airport Authority no longer requires an event permit for Y-E Rallies. Our annual Young Eagle Rally will be held on Saturday October 21, 2017, beginning at 8:00 am. This event will take place at Dunn Airpark on 480 N Williams Ave. Titusville. This is the airport where the Spacecoast Skydive center is located. 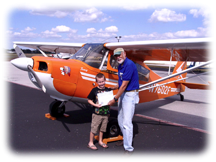 Young Eagles is a national program started in 1992 by EAA (Experimental Aircraft Association) to introduce youth to flying by giving them a free airplane ride. This is a fun and educational experience and an introduction to aviation for youngsters between the ages of 8 - 17yrs. inclusive. Nationwide, we've flown over two million youth since 1992! 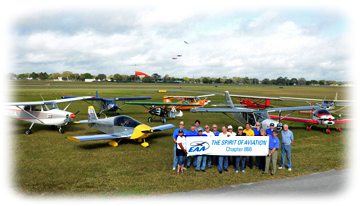 Titusville is the home of chapter 866 of the EAA and we've been involved with this program since the year 2000. Our pilots have provided free rides for hundreds of youth here! For some this can be the very beginning of an aviation career! 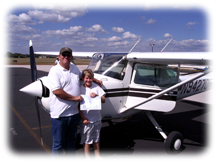 Several Young Eagles who have flown with us have become pilots themselves and one, as a result of a ride in 2013, is a pilot with an instrument rating and is enrolled in a career aviation program at Liberty University today. Most of all though, this is a great day of fun for the youth and parents to be at the airport and be around some interesting aircraft and people. 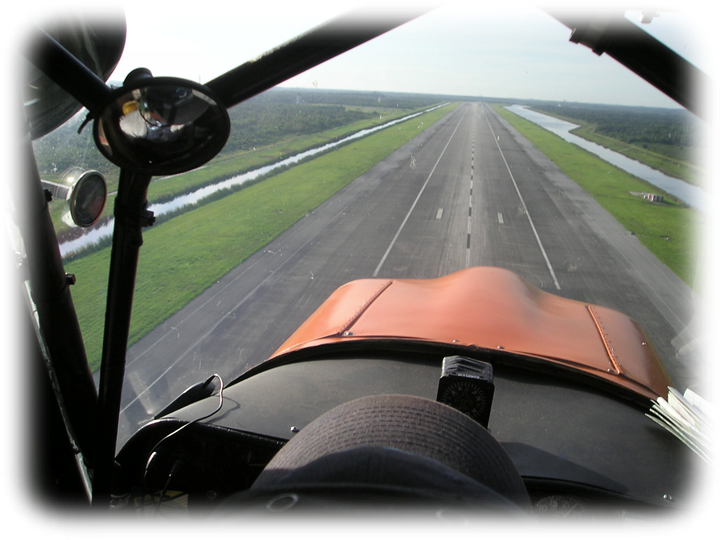 Our pilots are FAA licensed and current and experienced. The actual ride is 20 to 30 minutes long. Before the ride, the candidate will attend a short "ground school" where they'll be told about the airplanes we will be flying. Our ground crews are very experienced and their number one objective is the safety of all who attend this event so it is fun for everyone. By then, the weather should be real nice and we hope to have a nice turn-out of youths for the Rally. So, it's not too soon to mention this to your relatives or neighbors and try to round up of few youngsters who would like to go for an airplane ride. Young Eagles must be aged 8 to 17, and must have a signed parental form. We have done a Y-E Rally every October for a number of years now, and it's one of the most fun and rewarding events that we do! 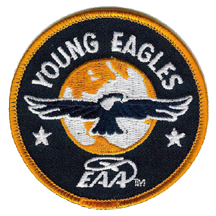 2017 marks the 25th anniversary of the Young Eagles program, which has provided more than 2 million young people ages 8-17 with an introduction to the world of personal aviation. Our Fall Young Eagles rally is always one of the most fun, rewarding and memorable things we do all year. We can always use an extra hand there as well. If you'd like to see some youngsters put their smart phones down for a few minutes and enjoy the thrill and wonderment of flying in a small airplane, then come out and help with the Young Eagle rally later this month. Even if you just chat with the parents or young folks while they wait, and share your passions for aviation and answer their questions, I bet you'll get more out of it than you expect!! 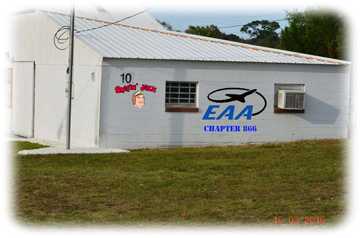 I also want to point out that our neighboring EAA Chapter 724 down at Merritt Island will be having one of their Young Eagle Rallys on the Saturday before ours (Oct. 14th). For more details about their event, you can contact their President, Don White at this e-mail: (don@eaa724.org). So, be sure to pick up a few Young Eagle pamphlets at our next meeting and share with friends or family. 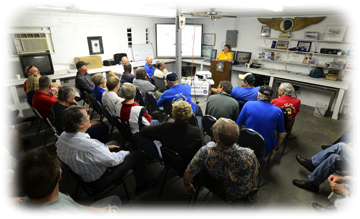 At our next meeting, we'll be talking Young Eagles, Project Reports, First Flights, and watching a short video about Oshkosh before enjoying some light refreshments. Be sure not to miss out! 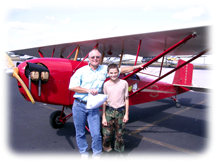 Mark Oriza was flying his homebuilt SE5 around Dunn Airpark on this Independence Day 2005. He had her decked out in the "colors."